Much acclaim, including a four-star review from Roger Ebert pushed me to see this film in theatres. It’s a small scale story about two hit men, hanging out in Bruges Belgium waiting for their next instructions. The trailer is cut to be like a Guy Ritchie-Matthew Vaughn film, and though it has the same sense of humour, it’s a largely a low key character film. It’s another in a long history of recent British gangster films that entertain, but never quite take off and soar as the Hollywood and Asian cinema have been able to do. 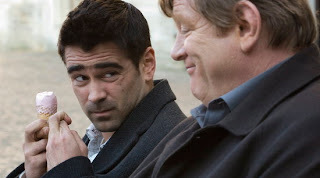 Ray and Ken (Colin Farrell and Brendan Gleeson) are a couple of wisecracking hit men who have just completed a job. We’ve never told what the job is, only that Ray and Ken are to convene in Bruges for further instructions. “Where the fook is Bruges?” Ray asks. Bruges is a small tourist town in Belgium, known for its uniquely preserved medieval architecture. When they arrive Ray discovers it’s a boring ol’ tourist trap with little action and excitement. Ken, who’s enamoured by the culture and history, falls in love with city. A palpable tension exists between the two beyond Ray’s restlessness with the city. We discover their job didn’t go as planned, resulting in more death than necessary. Their boss, Harry, who we only know as an ornery voice on the other end of a phone has nefarious plans for Ray and Ken. With their lives on the line, Ray and Ken's loyalties to each other and their own personal scruples are put to the test. Martin McDonagh, who generated buzz for himself with his Oscar-winning short film “Six Shooter”, is skilled with the genre. Ray and Ken are a great British “Odd Couple” - Brendan Gleeson is the straight man and Colin Farrell is the wild man. For the first two acts, McDonagh concentrates on the two characters, their relationship with each other and as well as their relationship with the town and its people. Ken, in fact, courts a local girl which feels like genuine love. But McDonagh also silently plants the seeds for the third act, which has Harry (Ralph Fiennes) arriving in Bruges to ‘finish the job’. The seemingly meaningless actions of Ray and Ken and all the minor characters they meet along the way are cleverly weaved in and affect the outcome in the final violent confrontation. McDonagh commits an error though. He falls in love with his cleverness of his “Seinfeld-like” wrap-up, but forgets that the strength of his film is his two characters. There’s a very powerful emotional moment which occurs at the 90mins mark of the film, which is so well-planned and executed, it would have made a great finale, if the film ended there. But McDonagh continues the action for another 5mins, a chase scene which serves to create action and but not drama. The film is less powerful because of it. “In Bruges”, with it’s sharp dialogue and strong characters, entertains and generates great laughs, and though it narrowly misses it’s chance to soar, it's still a fun, enjoyable romp. Ray and Ken are not British, they're Irish. Considering the cultural misunderstandings in the film it's a little ironic to call them British, maybe this was on purpose? Thanks Shane for your comment. Just to clarify, I didn't call them British, or Irish. I referred to the film as British - it's a Film 4 Production.